The AC series appeared in the midst of the First World War. Until the end of the war, the company Mack had sent to European countries more than 2,5 thousand trucks AC. Mostly it was 3,5 and 5 ton versions, equipped with a four-cylinder engine (7.7 liter, 40 hp), 3-speed gearbox, chain-driven rear wheels with solid tires and a frame of chrome-nickel steel. A characteristic shape of front mask was determined the location of water radiator between hood and open cab, which provided the access to the engine from three sides. Since 1917, 7.5-ton truck was produced, capable to carry light French tanks Renault FT17. 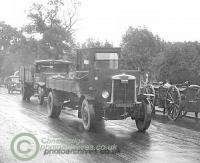 Until 1920, about 4.5 thousand trucks of AC model were produced, most of which were used in the armed forces as a flatbed trucks, artillery tractors, dump trucks, repair shops, winches for balloons, etc. In 20e, 8-ton long wheelbase chassis with a generating station, located in front of the engine and serves to feed the lighting projectors was added to the range, as well as several experienced half-track trucks. Since 1929, the U.S. Army used the 8-ton trucks AP (6x6), which became the development of AC series, which were used as artillery tractors T2. The trucks got 6-cylinder 150-horsepower engine, closed cab and disk wheels with pneumatic tyres.